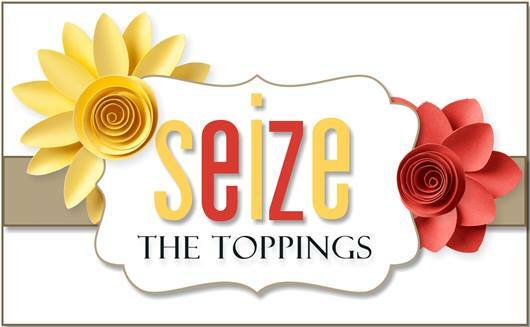 Hello Everyone, We have a fun an quite easy topping this time around over at Seize the Birthday. 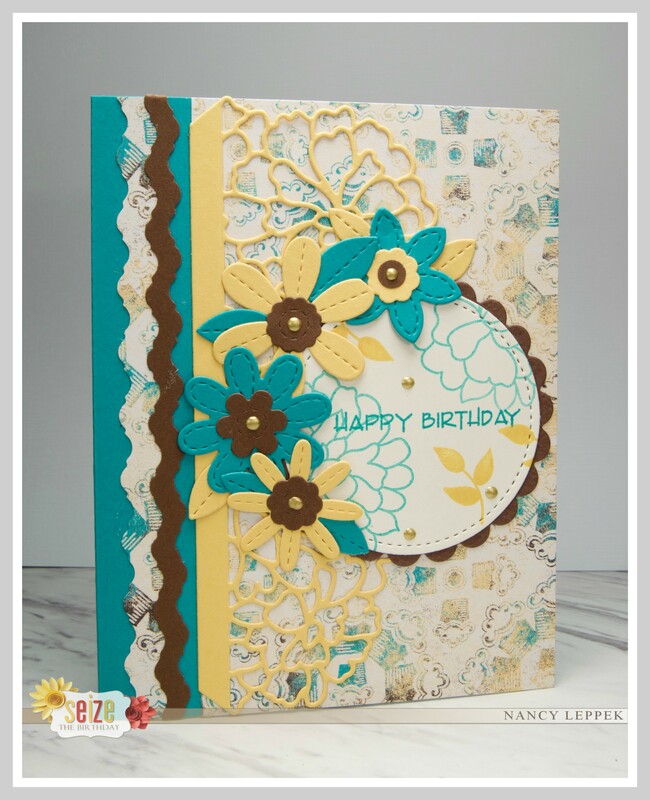 All you have to do is use patterned paper on your card and or project. I just went through ALL of my paper a few weeks back and purged some that I have no idea why I bought in the first place. LOL I brought a huge stack to school and gave it to the Pre-K teachers, they were in hog heaven. The paper I used on this card is from Stampin Up, and one that I thought was still pretty enough. LOL Isn’t if funny how are tastes change over time? One minute you are crushing on teal and the next minute it’s purple. Well, I am a huge fan of teal and I thought it paired nicely with yellow and brown. Anyhoozal, My supplies for this card are either; Stampin Up-paper, circle die, intricate floral die and floral stamp, MFT- flowers, Verve-sentiment. Please come check out the rest of my teams fabulous cards, along with our Surprise Party Guest SonjaK! They are something special! All your papers work nicely together, Nancy. I’ve purged my papers (12 x 12) several times and could probably do it again. I do love patterned paper once in a while but my 6 x 6 will last me a long time. This is gorgeous! I don’t remember that SU paper at all, but it is BEAUTIFUL! Hi LeAnne, it’s in the Cupcakes and Carousel pack! Thanks for stopping by!! So pretty. Love the colors and papers. Those colorful flowers are so pretty. I totally love that pairing of teal (in fact, I think teal is like black – it looks well with so many colors!!) And I like how your choice of flowers also resemble those on the pp – its great to find supplies like that in your stash, isn’t it! Such a great card! Super pretty card, Nancy! I love the colors. Who makes the intricate floral die? It’s gorgeous! Oh wow, what a wonderful card! The color combination is so beautiful and a perfect fit for the pp. I also like the florals and the ovarall design of the card. I also have a huge pile of pp which I probably won’t use up in my lifetime anymore. Giving it to school is a wonderful idea – and one I have to remember once I sort through my stash again.